Our informal “DIY day” continues here: Fabienne Serriere follows up her how to get started with Csound tutorial with a walkthrough on how to build your own MIDI hardware, complete with custom sensors. It’s quite nice, but the aesthetics are a wee bit on the unfinished side (think raw, open breadboard). Now we need her to give us parts 3, 4, 5, and 6, I guess! 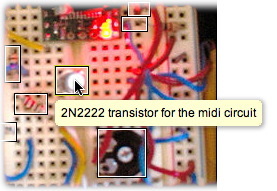 Which brings me to my next point: Fabienne’s tutorial will get your feet wet in programming your own circuits, but if you want to skip straight to playing with sensors, consider Eric Singer’s MidiTron, a $149, pre-built board that converts digital and analog sensors to MIDI. With the time you save, you could build, you know, a case. Or have time to make music. Or you could just skip to buying a pre-built Lunar Module, which, unlike your own handiwork, actually has a warranty. And of course, that’s the nice thing about all of this: you can start wherever you want, from forging an instrument out of raw iron ore to buying something at the local Guitar Center and everywhere in between. For the definitive reference to all this sort of stuff, see Tom Igoe’s physical computing page and book. Updated: Fabienne points out she’s got additional photos, annotated on Flickr with each component labeled. Nicely done!